Years ago my sister lived in Chicago. My mom and I went out to visit her. We had a great time. We went through the city, saw Wicked for the fist time, and just had a blast being together. It was a short trips, but we had a great time. Do you know what made that trip even better? This chocolate sauce. I honestly don't remember if we put this sauce on our ice cream, or if we just ate the sauce with a spoon. It is that good! You don't get hot fudge that tastes like this in the grocery store. There are so many reasons to make things from scratch, but taste alone is enough for me! Melt butter and chocolate together over low heat. stir in whipping cream, salt, sugar, corn syrup, and vanilla. Bring to a boil over medium heat stirring occasionally. 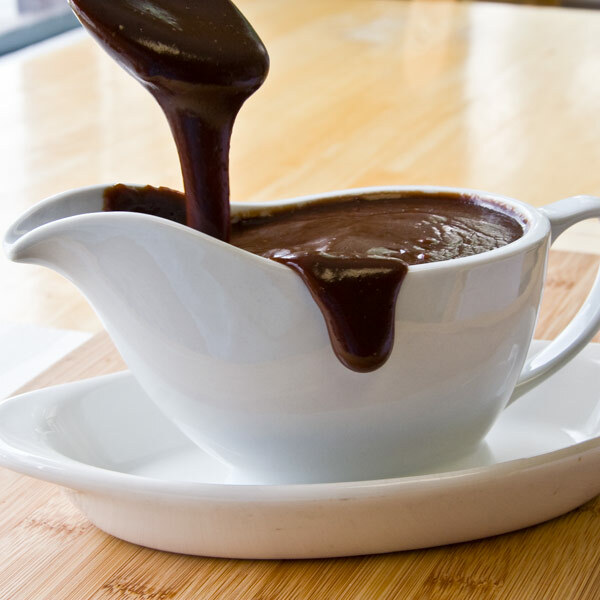 For a thick hot fudge bring mixture to 235 degrees. If you like your chocolate a little thinner boil until mixture reaches 220 degrees. Serve warm over ice cream (or just eat it with a spoon). Looks amazing,I could eat it with a spoon! I can see not bothering with ice cream with this sauce! :-D And yep; Chicago is a great place! For sure it looks heavenly, beautiful and so tempting. Oh my! Heavenly is the best way to describe this delicious-looking fudge! mmmm...chocolate soup! I am drooling! Whoa that's a lot of cream and butter in ratio to the chocolate. Must be very rich! I need to be careful with this sauce. I can eat it by the spoonful. Yummy!